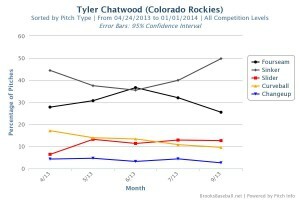 If you look at anything other than ERA, it’s obvious that Tyler Chatwood wasn’t very good last year. Sure, his 3.15 ERA was the 24th best ERA among the 128 starters with 110 or more innings (Chatwood had 111.1 IP), but it’s just about the only thing on his player page that looks good from last year. His xFIP and SIERA were both 4.00 or higher, his WHIP was an ugly 1.43 and both his strikeout rate (13.9%) and walk rate (8.6%) were well below average. But there was a point last summer where Chatwood looked pretty good. After his first eight starts of the year he had a 2.22 ERA and his strikeout rate was league average. As Chris Cwik noted around that time, Chatwood converted to pitcher his senior year of high school then got drafted and immediately went to rookie ball. He also cracked Baseball America’s top 100 in 2011, so it’s obvious that people thought his arm had potential. With that string of eight solid starts, it seemed like maybe Chatwood was starting to put it all together. But from that point on his strikeout rate was a paltry 10.5%, and he only had five more strikeouts than he did walks. Within that bad stretch he struck out just 31 batters in 12 starts. What’s insane is that he had an 11 strikeout game in that stretch. Along with the ten strikeout game mentioned earlier, those were the only two instances in which he topped five strikeouts in his 20 starts. It’s somewhat interesting to note that those two big strikeout games were the two games where Chatwood used his slider most. In the 10 K game he threw the slider 24 times and in the 11 K game he threw it 16 times. That’s a little misleading because there were several games when he threw his slider 13-15 times and struck out five or fewer batters, but it fell in line with Cwik’s observation after Chatwood’s hot start that the slider was driving his success. 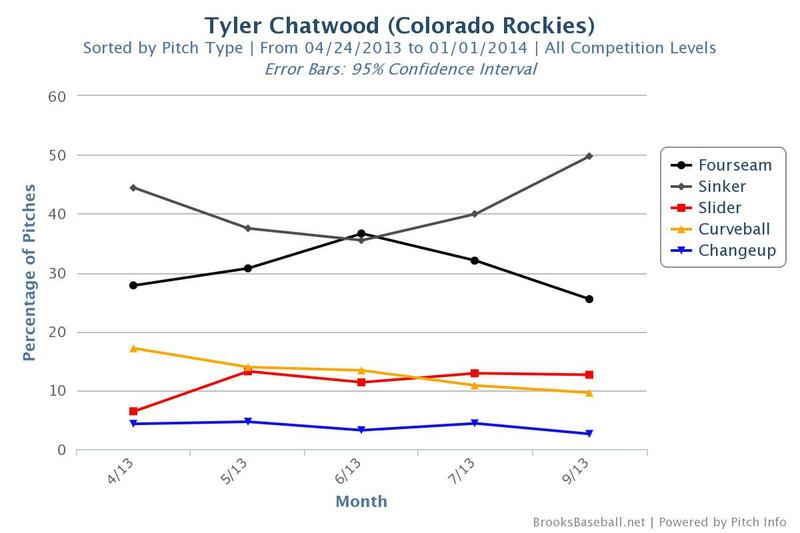 Though Chatwood didn’t always have the same success when he used the pitch frequently, it’s obviously his best pitch. Check out these two charts below comparing his slider to his other offerings. Part of the problem is that he’s simply not using the pitch very much. Going back again to the 128 starters who had 110+ IP, Chatwood was only 49th in percentage of slider usage (11.9%) despite having the 18th best wSL/C. As the chart below will show, he used his slider about as much as his curveball last year even though his curve had a negative pitch value. The encouraging thing there is that his slider usage trended upwards and his curveball usage downwards to where he was using the slider more at season’s end. But to really improve, he’s going to have to rely a lot more heavily on that slider. If he upped it to the 23-25% range, I think he could get that strikeout rate up to an acceptable place. Earlier I said that Chatwood’s unrepeatable 3.15 ERA was just about the only thing on his player page that looked good from last year. I said just about because there was one other thing that looked good: his ground ball rate. Going back to 2012, his ground ball rate in his last 32 starts is up over 57%. Last year it was 58.5% which was the second best rate in the league among pitchers with at least as many innings as Chatwood. That’s how he also managed to have the second best HR/9 (0.40) in that sample of pitchers despite his home ballpark being Coors. Check out the two charts below showing Chatwood’s ground ball rates in the minors and which pitches he gets grounders with. That skill isn’t going anywhere, and it’s going to be a massive help to him given his home park. His HR/9 probably isn’t going to continue to be elite, but the Steamer projection of 0.73 is reasonable and still well above average. To put a bow on this, I started out by discussing how bad Chatwood really was last year despite the pretty ERA. That was to put you on notice not to draft him. But that doesn’t mean he doesn’t have a chance to turn into something useful. The ability to keep balls on the ground and in the park gives him a decent chance to have an ERA that outperforms his xFIP and SIERA. And he also has the potential to lower his ERA along with his xFIP and SIERA if he’ll start using his slider more. It’s an above average pitch that he can gets whiffs with, but he’s wildly under using it right now. If he starts using it more and gets his strikeout rate up around league average, he could turn into something. And keep in mind that more sliders shouldn’t hurt his ground ball rate since that pitch is second only to his sinker in terms of inducing ground balls, and the increase should come at the expense of his curve. If he got the strikeout rate up around league average, he’d have numbers a lot like what Ivan Nova did last year. 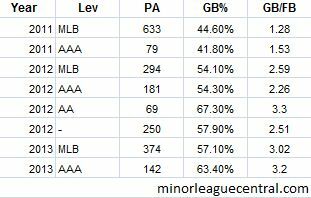 Nova had a league average strikeout rate, a walk rate slightly worse than league average, a good HR/9 and a high groundball rate. That yielded a 3.76 SIERA and 3.77 xFIP with a 3.17 ERA thanks to the high strand rate that a low home run rate can facilitate. Despite only throwing 139.1 innings, Nova finished the year as the 66th most valuable fantasy starter. That’s obviously a massively optimistic comp, but I do think it’s at least within the realm of possibility if Chatwood starts playing to his strengths. So if you notice Chatwood is pitching well while using that slider more and seeing his K% push league average, he might be worth picking up at that point and could certainly be a spot starter. But stay away until then. We hoped you liked reading The Path to Tyler Chatwood Having Fantasy Value by Brett Talley! So….I guess I shouldn’t keep him for $6 in a 5×5 league. Thanks for the in-depth info.